Identification. 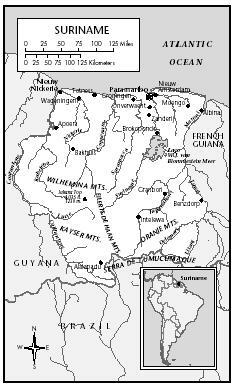 The name "Suriname" (Sranan, Surinam) may be of Amerindian origin. Suriname is a multiethnic, multicultural, multilingual, and multireligious country without a true national culture. Location and Geography. Suriname is in South America but is considered a Caribbean country. The total area is 63,250 square miles (163,820 square kilometers). The majority of the inhabitants live in the narrow coastal zone. More than 90 percent of the national territory is covered by rain forest. Suriname is a tropical country with alternating dry and rainy seasons. Since the early colonial days, Paramaribo has been the capital. Demography. The official population estimate in 2000 was 435,000. Approximately 35 to 40 percent of the population is of British Indian descent (the so-called Hindostani), 30 to 35 percent is Creole or Afro-Surinamese, 15 percent is of Javanese descent, 10 percent is Maroon (descended from runaway slaves), and there are six thousand to seven thousand Amerindians. Other minorities include Chinese and Lebanese/Syrians. Since 1870, the population has increased, but with many fluctuations. In the 1970s, mass emigration to the Netherlands led to a population decrease; an estimated 300,000 Surinamers now live in the Netherlands. Linguistic Affiliation. The official language and medium of instruction is Dutch, but some twenty languages are spoken. The major creole language and lingua franca is Sranantongo, which developed at the plantations, where it was spoken between masters and slaves. Sranantongo is an English-based creole language that has African, Portuguese, and Dutch elements. Attempts to make Sranantongo the official language have met with resistance from the non-Creole population. Other major languages are Sarnami-Hindustani and Surinamese-Javanese. The Chinese are Hakka-speaking. The Maroon languages are all English-based. Eight Amerindian languages are spoken. Symbolism. The major symbols of the "imagined community" are the national flag, the coat of arms, and the national anthem. The flag was unveiled at independence. It consists of bands in green, white, red, white, and green. Green is the symbol of fertility, white of justice and peace, and red of patriotism. In the center of the red band is a yellow five-pointed star that stands for national unity and a "golden future." The five points refer to the five continents and the five major population groups. The national coat of arms shows two Amerindians holding a shield and has the motto Justitia-Pietas-Fides ("Justice-Love-Fidelity"). The left part of the shield shows a ship; the palm tree on the right represents the future and is the symbol of the righteous man. The national anthem is based on a late nineteenth-century Dutch composition. In the 1950s, a text in Sranantongo was added. In the first lines, Surinamers are encouraged to rise because Sranangron (Suriname soil or territory) is calling them from wherever they originally come. Independence Day has lost its meaning for many people because of the political and socioeconomic problems since independence. The mamio ,a patchwork quilt, is often used as an unofficial symbol of Suriname's variety of population groups and cultures. It reflects a sense of pride and a belief in interethnic cooperation. The country's potential richness and fertility are captured in the saying "If you put a stick in the ground, it will grow." colonists and Sephardi Jewish refugees from Brazil introduced the cultivation of sugar. When the Dutch took over from the British in 1667, fifty sugar plantations were operating. After a decrease in the number of estates, Suriname developed into a prosperous colony producing sugar and later coffee, cacao, and cotton. In the nineteenth century, the value of these products dropped sharply, although sugar exports were more stable. In 1788, slaves numbered fifty thousand out of a total population of fifty-five thousand, yet there were not many slave rebellions. By 1770, five thousand to six thousand Maroons or runaway slaves were living in the jungle. After waging protracted guerrilla wars, they established independent societies in the interior. Between 215,000 and 250,000 slaves were shipped to Suriname, mostly from West Africa. Slavery was not abolished until 1863. After a ten-year transition period in which ex-slaves had to perform paid work on the plantations, contract laborers from Asia were imported to replace them. Between 1873 and the end of World War I, 34,304 immigrants from British India (the Hindostani) arrived. A second flow of immigrants came from the Dutch East Indies, bringing almost 33,000 Javanese contract laborers between 1890 and 1939. The idea was that the Asian immigrants would return to their homelands as soon as their contracts had expired, but most remained. The policy of the Dutch colonial administration was one of assimilation: Native customs, traditions, languages, and laws had to give way to Dutch language, law, and culture. The introduction of compulsory education in 1876 was an important aspect of this policy. Javanese and Hindostani traditions proved so strong, however, that in the 1930s assimilation was replaced by overt ethnic diversity. Against the will of the influential light-skinned Creole elite, the governor recognized so-called Asian marriages and other Asian cultural traditions. The Creole elite increased its influence in the wake of a political process that started in 1942, when the Dutch promised their colonies more autonomy. The Creole slogan "Boss in our own home" expressed the prevailing feeling. Before the first general elections in 1949, number of political parties were formed, mostly on an ethnic basis. In 1954, Suriname became an autonomous part of the Kingdom of the Netherlands. World War II had a profound effect on the nation's socioeconomic structure. The presence of U.S. troops to protect bauxite mines and transport routes led to an increase in employment and migration from the rural districts to Paramaribo and the mining centers. 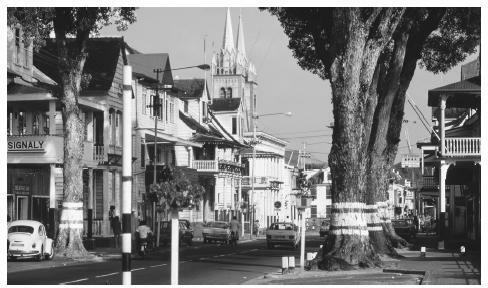 This urbanization gradually made Paramaribo a multiethnic city, and the proportion of Creoles in the urban population dwindled. The position of the light-skinned Creole elite was challenged by the so-called fraternization policy, which involved political cooperation among nonelite Creoles and Hindostani. Creole nationalism later led to Hindostani opposition. Despite the strong resistance of the Hindostani party and the fact that the cabinet had only small majority in the parliament, a Creole-Javanese coalition led the nation to independence on 25 November 1975. National Identity. After independence, Suriname attempted to bring about a process of integration that would transcend ethnic, social, and geographic barriers. That process was accelerated by the military regime that gained power on 25 February 1980, but lost popular backing when it committed gross violations of human rights during the socalled December murders of 1982. In 1987, the transition to democracy restored the "old political parties" to power. Race, class, and ethnicity continue to play an overwhelming role in national life. Greater Paramaribo, with 280,000 inhabitants, is the only city and the traditional commercial center. Paramaribo is multiethnic, but the rest of the coastal population lives in often ethnically divided villages. Paramaribo is a three hundred-year-old colonial town with many wooden buildings in the old center. A distinctive national architectural style has developed whose most important characteristics are houses with a square brick foundation, white wooden walls, a high gabled roof, and green shutters. Multiethnicity is demonstrated by the many churches, synagogues, Hindu temples, and mosques. Food in Daily Life. The nation's many immigrants have left culinary traces. The only truly national dish is chicken and rice. In Paramaribo, Javanese and Chinese cuisine and restaurants are popular. In the countryside, breakfast consists of rice (for the Javanese), roti (Hindostani), or bread (Creoles). The main meal is eaten at 3 P.M. , after offices have closed. After a siesta, sandwiches and leftovers are eaten. Drinking water and street food are generally safe. Food Customs at Ceremonial Occasions. At weddings and birthday parties, especially those celebrating a jubilee year, the so-called Bigi Yari , huge amounts of food are served. In Javanese religious life, ritual meals called slametans commemorate events such as birth, circumcision, marriage, and death. Basic Economy. Commercial agriculture is limited to the narrow alluvial coastal zone. Smallholders are mostly Javanese and Hindostani. The largest rice farms are government-owned. The country is self-sufficient in rice, some tropical fruits, and vegetables, which also are exported. In 1996, agriculture contributed 7 percent to the national economy and employed 15 percent of the workforce. There is a small fishing industry. Overall, the country is a net importer of food. Land Tenure and Property. Provisions for collective landholding are part of the legal system. Collective holding of agricultural lands can be found among Maroons, Amerindians, and Javanese. Commercial Activities and Major Industries. The most important sector is mining, with bauxite and gold the leading products. Most of the bauxite is processed within the country produce alumina. Alumina and aluminium account for three-fourths of exports. Gold production is difficult to estimate. Trade. In the 1990s, the main trading partners were Norway, the United States, the Netherlands, and the Netherlands Antilles. Besides mining products, exports include rice, bananas, shrimp, and timber. Imports come mainly from the United States, the Netherlands, and Trinidad and Tobago and include capital goods, basic manufactured goods, and chemicals. Division of Labor. More than half the labor force is employed by the state. Those jobs are officially assigned on the basis of education, experience, and competence, but unofficially, ethnicity and political affiliation often play a role. Classes and Castes. Classes are increasingly multiethnic as a result of the social mobility of all population groups. The class structure is based on income and, to a lesser degree, social position. The elite includes import–export merchants, entrepreneurs, politicians, and military officers. Devaluation of the currency has squeezed a traditional middle class that is dependent on fixed incomes (civil servants, pensioners, teachers, paramedics). The gap between rich and poor is widening. The Hindostani could not maintain their caste system once they left India, but some notion of caste persists. Government. Suriname has been an independent republic since 1975. Its political institutions are defined by the constitution of 1987. The National Assembly has fifty-one members who are elected for a five-year term by proportional representation. The president is elected by a two-thirds majority in the Assembly. The president appoints the cabinet ministers. The Council of State, chaired by the president and including representatives of the military, trade unions, business, and political parties, can veto legislation that violates the constitution. The decorative façade of a house in a Djuka village. Commercial oil paints are applied to the wood with a length of a cut plant stem. Leadership and Political Officials. Most political parties are based on ethnicity. Party politics are characterized by fragmentation and the frequent splitting up of parties. Since the elections of 1955, no party has had majority in the National Assembly, and so coalitions of are always necessary to form a government. Many party leaders are authoritarian. Clientelism, a patron–client relationship between a politician and voters in which the politician delivers socioeconomic assistance (e.g., jobs) in exchange for a vote, is an important feature of politics. Social Problems and Control. The administration of justice is entrusted to a six-member Court of Justice and three cantonal courts. The crime rate has increased since the 1980s because of socioeconomic regression; crimes against property accounted for nearly 80 percent of all crimes in 1995. Formal punishments include jail sentences and fines; no death penalty has been enacted since World War II, but the law is still on the books. So far, human rights violations have not been prosecuted. Informal control is still fairly high but has eroded since a military coup in 1980. Military Activity. The National Army played a major role in domestic (political) affairs from 1980 to 1992. It was involved in a civil war in the interior in the 1980s and in a United Nations mission in Haiti. There is a limited social welfare system funded by the state. Assistance by social organizations and benevolent societies to the elderly, poor, and infirm remains indispensable, as do remittances and care packages sent by emigrants. Labor unions traditionally play an important political role. The number and significance of human rights, women's, and social welfare organizations has grown. Suriname is a member of several major global and regional organizations. The Relative Status of Women and Men. Official labor force figures underestimate the participation of women, many of whom are employed in the informal sector. Women also work in subsistence agriculture. Despite the economically independent position of many women within their households, in society in general women cannot claim equal status. The domestic status of women varies. Women are the emotional and economic center of the household (matrifocality) in many Creole groups but are subordinated in traditional, patriarchal Hindostani circles. Carrying bundles balanced on the head is common in Djuka villages in Suriname. Marriage. Although many marriage partners are of the same ethnic group, mixed marriages do take place in Paramaribo. In traditional Hindostani families in the agricultural districts, parents still select partners for their children. Weddings can be very lavish. Living together without being married is common but is not acceptable to traditional Hindostani, among whom the bride is expected to be a virgin. In the Caribbean family system, female-headed households and the fact that women have children from different partners are accepted. Some women practice serial monogamy; it is more common for men to have several partners simultaneously. Having a mistress ( buitenvrouw ) is accepted and usually is not shrouded in secrecy. Maroon men often have different wives in different villages; those men do, however, have the responsibility to supply each wife with a hut, a boat, and a cleared plot for subsistence agriculture. Domestic Unit. Domestic units vary in type, size, and composition, ranging from female-headed households to extended families. Among the Hindostani, the institution of the joint family has given way to the nuclear family, and the authority of the man is eroding. Kin Groups. The clan system among the Maroons is based on a shared belief in a common matrilineal descent. The population of a village can overlap considerably with a matrilineal clan ( lo ). Infant Care. Babies usually sleep in cribs near the mother and are moved to a separate room when they are older. In the interior, mothers carry their babies during the day; at night, babies sleep in a hammock. In contrast to Maroon women, Amerindian women are reluctant to let anybody touch their babies. Child Rearing and Education. Education and diplomas are considered exceedingly important by all population groups. The Maroons and Amerindians have rites of passage. Among the Wayana, boys undergo an initiation rite, eputop , in which wasps are woven into a rush mat in the form of an animal that symbolizes power and courage. The mats are tied to the boys, who must withstand the stinging without a whimper. Among the Caribs, the girls undergo a similar ritual, except that stinging ants rather than wasps are used. The circumcision of Muslim boys is considered a rite of passage. Higher Education. Despite economic constraints, public expenditure on education remains relatively high. Higher education is free. Education is compulsory between ages six and twelve. Between ages six and seventeen, school enrollment ratio is officially about 85 percent but the dropout rate is high. The adult literacy rate was 93 percent in 1995. Paramaribo is the only city in Suriname and, as such, serves as the country's commercial center. A typical, mainly urban Creole, expression is "no span" ("Keep cool; don't worry"), symbolizing the generally relaxed atmosphere. The population has a reputation for being hospitable, and most houses do not have a knocker or a bell. Shoes often are taken off when one goes inside. Guests usually are expected to partake in a meal. A casual conversation is initiated by a handshake, and good friends are greeted with a brasa (hug). Children are expected to respect adults, use the formal form of address when speaking to them, and be silent when adults speak. Religious Beliefs. The three major religions are Hinduism, Christianity, and Islam. About 80 percent of the Hindostani are Hindus, 15 percent are Muslims, and 5 percent are Christians. Most Creoles are Christians: the largest denominations are Roman Catholicism and the Moravian Church (Evangelische Broedergemeente); the Pentecostal Church has been growing. Most Javanese are Muslims. Officially most Amerindians are baptized, as are many Maroons. However, many of these groups also adhere to their traditional religious beliefs. The most important alternative system for Maroons and Creoles is Winti, a traditional African religion that was forbidden until the 1970s. Religious Practitioners. Religious practitioners of all beliefs are paid by the Ministry of the Interior. Despite a lack of public funding, health care indicators are comparable with those in other Caribbean countries. Life expectancy at birth was 70.5 years in 1996 compared with 64.8 years in 1980. Infant mortality was 28 per 1,000 live births in 1996 (46.6 in 1980). Specialized care is available at the University Hospital in Paramaribo. There are medical posts throughout the interior. In all population groups, traditional healers are often consulted. Holidays include 1 January (New Year's Day), Id al-Fitr (end of Ramadan), Holi Phagwa (Hindu New Year, March/April), Good Friday and Easter Monday (March/April), 1 May (Labor Day), 1 July (Keti Koti, Emancipation Day, previously Day of Freedoms), 25 November (Independence Day), and 25–26 December (Christmas). Support for the Arts. Government and private, support for the arts is virtually nonexistent. Most artists and writers are amateurs. A lack of publishers and money makes writing and selling literature a difficult enterprise. Most authors try to sell their publications to friends or on the street. The great majority of established authors live and work in the Netherlands. Oral literature has always been important to all the population groups. The University of Suriname in Paramaribo has faculties of law, economics, medicine, and social sciences. There are also a number of technical and vocational schools. Bakker, Eveline, et al., eds. Geschiedenis van Suriname: Van stam tot staat , 2nd ed., 1998. Binnendijk, Chandra van, and Paul Faber, eds. Sranan: Cultuur in Suriname , 1992. Bruijning, C. F. A., and J. Voorhoeve, eds. Encyclopedie van Suriname , 1978. Buddingh', Hans. Geschiedenis van Suriname , 2nd ed., 1995. Colchester, Marcus. Forest Politics in Suriname , 1995. Dew, Edward M. The Difficult Flowering of Surinam: Ethnicity and Politics in a Plural Society , 1978. Economist Intelligence Unit. Country Profile Suriname 1998–99 , 1999. Hoefte, Rosemarijn. Suriname , 1990. Lier, R. A. J. van. Frontier Society: A Social Analysis of the History of Surinam , 1971. Meel, Peter. "Towards a Typology of Suriname Nationalism." New West Indian Guide 72 (3/4): 257–281, 1998. Oostindie, Gert. Het paradijs overzee: De 'Nederlandse' Caraiben en Nederland , 1997. Plotkin, Mark. J. Tales of a Shaman's Apprentice: An Ethnobotanist Searches for New Medicines in the Amazon Rain Forest , 1993. Price, Richard. First-Time: The Historical Vision of an Afro-American People , 1983. Sedoc-Dahlberg, Betty, ed. The Dutch Caribbean: Prospects for Democracy , 1990. Szulc-Krzyzanowski, Michel, and Michiel van Kempen. Deep-Rooted Words: Ten Storytellers and Writers from Surinam (South America) , 1992. Krystal is right! Having lived in Suriname for approximabely 9 years, I can say that having a mistress was not socially acceptable. however, it does occur, and like in many countries around the world it is customary to pretend that it doesn't happen. Approximately, half the population of Suriname live in greater Paramaribo. Depending upon your definition of city and town, the other half of the population live in towns/cities and villages. The next largest town, that may be called a city is Niew Nickerie. Other towns are Moengo, Albina, Niew Amsterdam, Totness, Lelydorp and Wageningen to name a few. Suriname is a country blessed with several cultures and each with it own cusine; Chinese, Javanese, Indian, African, European, and Amerindian. Can you imagine the choices! Even so there are foods that are unique to Suriname. Pom a pie made with chicken and a ground root (called taijer) and bruine bonen (brown beans). However, the information gives a good overview of Suriname. As with the discriptions of the other countries many generalizations are made, but, this is useful in giving one a good feel for the culture of the country. The reader should realize that most countries are vibrant complex communities that are constantly changing and evolving; a few paragraphs would not be enough to discribe a country that is culturally diverse as Suriname. I lived in Suriname 1976-1985. It was the best times of my life. Paramaribo was a beautiful, virtually crime free and culturally diverse city. The population joined in the enjoying each other's culture. This sharing of culture, generally involved food, music and dance. At this time Suriname enjoyed the highest standard of living in South America, this unfortunatley ended when the military took over. Final word. Surinamers are proud of their multi-cultural heritage and embrace all the cultures of their small country as their own (and are offended if told otherwise). Many Surinamers, regardless of their race slip easily from one culture to the next, as easily as changing clothes. The only thing it is missing would be the climate of the area. Other than that, it's amazing information. this is a good website and has good thing but i still cant seem to find the answer i need for my project ! mabe im not looking good enouph cause this site has a lot of good answers ! haha keep up the good work ! Would Suriname benefit from migration into it? is it good for Ghanaian(african) to marry surinamese(hindoes).if so,what are the challenges in the marriage? Ha it's not mine,mine is North Carolina and the United States.LOL! I'm doing Suriname for my project, too. It is awesome information. Only thing is, what is the bibliography info for religion? I found this article and Dexter Hoayun's comentary very revealing and therefor I'm grateful. Being from Spanish-South America makes it easy to unknowlegde the existense of Surinam and the Guianas, the only three countries in southamerica that aren't iberian-descended. Also, I believe Surinam's history is very particular and wish I could get more info of it as well of its social castes and Paramaribo's viality and architecture. This article was particularly fascinating as I am researching my family tree. My grandfather immigrated to the U.S. from Suriname in the 1920s I believe. I am trying to find any family members - our last name is Kolom. If anyone has any information, please email me at achuko@yahoo.com and put "Kolom Family Tree" in the title. Thank you. I visited Surinam in 1972 and must say of all my travels this was the most beautiful country I have ever seen. The people were wonderful and extremely literate! I had a wonderful time and met the greatest love of my life...37 gears later and I still love him! I was doing a graduate research paper on the Djuka people and their similarities to the West Africans in Ghana. Interesting how closely related these two groups are. Though from a country in the South Pacific I enjoy reading about other countries espcially in the Carribean and South America.And one country that I admire most is Surinam. And thru the net I am beginning to learm more about this beatuful country Surinam. Some of the cultures there are quite similar to some of the countries in the Pacific. I am compiling a book on forgotten traditions of the world. Are there any that come to mind which should be compiled? I want to visit Suriname someday. I'm Javanese. I want to see whether the Suriname Javanese culture as same as Indonesian Javanese. This has been very interesting to know Since my family is from Suriname,I plan to take a trip to Suriname in January 2014,I haven"t been back to suriname since 1977 so a trip is in order.my family is very diverse,i even have some that are indoesian/asian desent. With that,I'am very proud of being a Suriamese even though I was born in the USA.my family keeps educating me about suriname and it helps me keep informed of my families homeland. Thank You,Mom. My parents are from Suriname. I was born in Canada but they raised my siblings and I there from 1982-1993. Yes, it really is a beautiful country. Reading this article, I miss being there. My Dad and sister live there now so I try to visit more often. The food is amazing! Good music too. Some information on Maroons of Suriname, referred to in this article as "djuka". Please note that the right spelling for Djuka is Ndyuka which is the name of a tribe in the east of Suriname. The word djuka is very derogative. Maroons feels offended when called "djuka". Djuka is a nickname with a very negative connotation. Maroons are descendants of enslaved Africans, who freed themselves from the atrocities of slavery on the plantations. October 10th of 2014 Suriname will commemorate 254 year signing of peace treaty on 10 October 1760 with the Okanisi/Ndyuka. It is called Maroon day, in Dutch "Dag der Marrons". A national holiday in Suriname since 2010. The Maroon population in 2013 is 117,000 (census 2012) second largest ethnic group in Suriname. For more information on Maroons referred to as Djuka in this article please send your request to mvnuma@yahoo.com or like Maroon Women's Network page on Facebook. Please note that we are grateful for the shared information on Suriname. I visited Suriname for Christmas last year (2013), it was the best vacation I had in a long time. I enjoyed every part of it. The food, the different places, and sights to see. We took back to Florida all the food our suitcases could hold, I came home and cannot wait for my next trip back to Suriname. The mosquitoes were my only problem, next time I have to bring some industrial strength mosquito repellant, also clothes to go along with the humidity, I can put my sweaters back in the closet. I fell in love with Suriname, and I can't wait to go back. I found this so so useful!! Thank you so much! It had all the information I needed that I didn't think I would actually be able to find!!! Great article - concise but yet very informative. I visited Suriname briefly, three times in the last two years but needed some information in English on the social characteristics of the country. The material in your article along with the comments provided by the Maroon Women's Network was very helpful. Thank you. this is a very helpful website especially when you have to do a project over a country!! Suriname mixed culture and weather is almost same like Singapore. I'm Singaporean(Chinese)My wife Javanese from Indonesia. So many similarity. Singapore small Garden city tall bulling. Here for a short job, love this place. i love Suriname and willing to migrate their after my retirement of service from the University and i wish to recieve more mails from indegenious surinamese. This article gives a general idea of Suriname, emphasis on general. A quick note though. Not all maroon languages are based on the English language. All of them are mixtures of West-African and European languages, the so called Creole language. It is easier to recognize Spanish, Portuguese or French than English. The Saamaka language, for example, is even considered the proto creole language. Very famous in the linguistic world. To all the people who can't spell "thanks". Go back to school you crusty musty piece of ice.